You know that sinking sensation you feel when a subway that shouldn't be crowded is actually packed to the goddamned gills with tremendously irritable New Yorkers? That sensation is called "goddammiseranger" and you should brace for a lot more of it, because by next year, the city's actual population will likely exceed the US Census' New York projections... for 2020. Essentially, NYC is five years ahead of schedule in its inevitable metamorphosis from "endurable urban purgatory" to "throbbing isle of flesh and trash." Super. 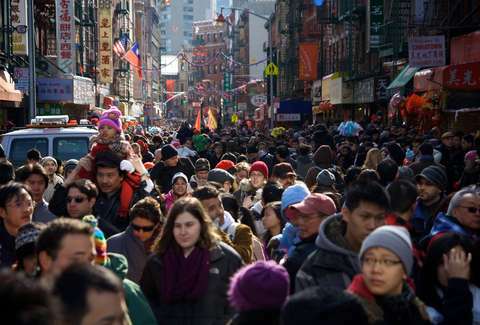 As YIMBY points out, the most recent US Census population estimate for NYC (taken July 2014) puts NYC's all-in population total at 8,491,079. (If you're looking for a visual, this number is just slightly higher than the line outside Frying Pan on the first day of day-drinking season.) That's up 52,700 residents since the 2013 numbers came in, and if we pick up the same number of new New Yorkers this year, we'll nudge past 8.55 million lost souls. NYC wasn't meant to reach that figure for another half-decade, and, well... I'll let YIMBY's Nikolai Fedak deliver the good news. "When looking for hope from a worsening housing crisis, there appears to be none," he writes, and "the housing crisis and the city’s overburdened infrastructure are only going to keep getting worse." Well, then. It's not all bad news, tho— oh no, wait. Yep. It's all bad news. Dave Infante is a senior writer for Thrillist, and a throbbing isle of flesh and trash. Follow @dinfontay on Twitter, Instagram, and Snapchat.